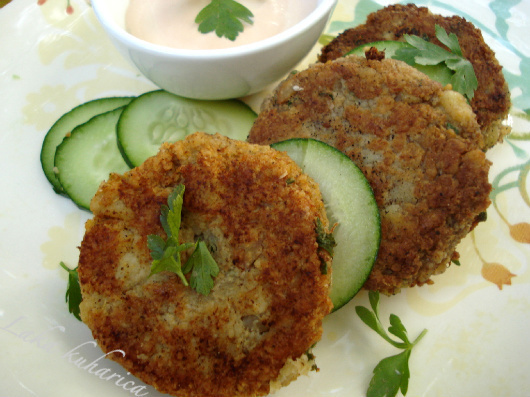 Delicious fish cakes ideal for lunch or supper. You can make them the previous day up to step 6 and just proceede the next day. Saves time! Steam fish fillets water, lemon juice, wine and parsley about 7 minutes or until it flakes. Sauté onion and garlic for 2 minutes in olive oil over low heat until translucent (make sure the garlic does not burn). Remove with slotted spoon and place on a paper towel. Mix mashed potatoes, onion, garlic, egg, egg yolk, pepperoncini, parsley, salt, pepper and Worcestershire sauce. Gently flake and fold the fish into potato mixture. If mixture is too wet, add homemade bread crumbs until cakes hold together. Roll out the mixture on floured surface to desired thickness (1-2 cm) and cut out 10-12 cakes. 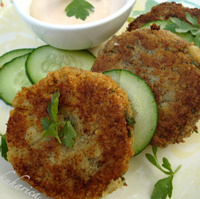 Fry cakes in hot butter over medium heat, about 4 minutes on each side until golden brown. Remove with slotted spoon and place on a paper towel. Serve immediately with a mix of homemade or bought mayonnaise, ketchup and chopped garlic (or other herbs - chives, parsley).